I’m always wondering what to do with the left-over almond bits when I make my almond milk smoothies. Each shake that I make leaves me with at least a cup of fresh almond meal. I can’t let all that organic soaked almond goodness go to waste. So I’ve been experimenting with different deserts. 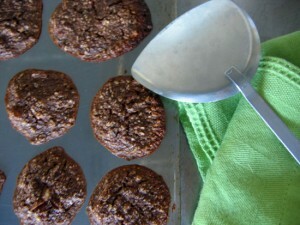 Recently I made almond meal cookies with raw cacao and dates. Can you say… YUM?! 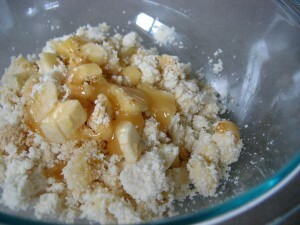 Another time I mixed the almond meal with banana, honey, and vanilla extract and ate it right out of the bowl. Any fruit should work well – I used pear once and it was super delicious and so simple to prepare. Now that I am staying away from honey for good, my next almond meal experiment will be dehydrated onion rings, drizzled with olive oil and coated with crunchy almond meal…stay tuned! To make the almond meal, leave 2-3 handfuls of raw organic almonds in a bowl of water overnight. 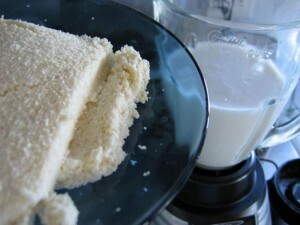 Remove skins, then blend with water (about 1-2 cups, depending on how thick you want the milk) until liquified. Strain almond milk to use in a smoothie, with cereal, or with hot chocolate. Save almond meal in refrigerator or use right away. Note: all ingredient quantities are approximate…most recipes call for sugar, agave nectar, honey, etc. and I wanted to avoid those so just threw in a few dates. Heat oven to 325 degrees Fahrenheit. Combine all ingredients in a bowl using a whisk or fork until mixed well. I just cut the dates up into tiny bits, so I would get bursts of date sugar as I bit into the cookies. If you prefer a smoother batter, you can use a food processor or blender. Form little balls about one inch in size, flattening them in your palms to about 1/4 inch thickness. Place on a baking sheet slightly greased with olive oil. Note: all ingredient quantities are approximate…I usually cook intuitively and don’t have a big sweet tooth so you may need to adjust quantities. Combine all ingredients in a bowl with a fork until mixed well. Sounds very yummy. 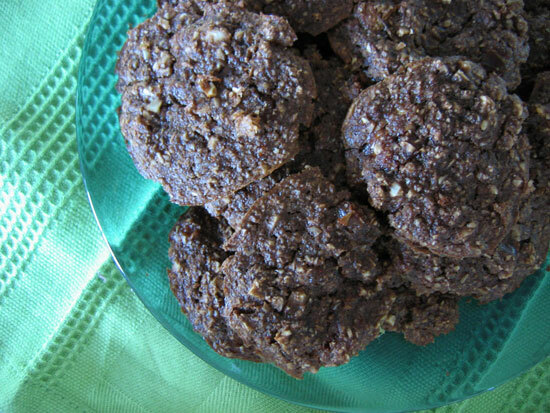 I’ll have to try that cacao almond cookie recipe, but I just made some other almond cocoa (not cacao) goodies, so I’ll have to wait.